"Metaphorically a mother to many, physically a mother to none." 1. You normally drive your friends around. You are the chauffeur of your friend group because you are the only one who has any sense of direction. 2. You remind everyone what events are coming up. Your calendar is detailed with not only your schedule, but the important events on your friends' schedules as well. 3. You make your friends to follow the rules. The rules were placed there for a reason and you like to follow them. You get really uncomfortable when your friends want to test the limits of legality. When you do break the rules, your friends wonder if you were replaced by your evil twin. 4. You normally clean up after your friends. Whether it is your dorm room, your house, their dorm room or their house, you clean up after everyone. It's not something you are asked to do, you just naturally do it. Sometimes you even enjoy cleaning up. 5. You give your friends lots of advice. Your friends come to you will all their problems. You are definitely not wiser than them, but they think you have all the answers. They may not take your advice, but hey they came to you before they made a decision. 6. You believe in your friends. Whether it is an econ test, a late night of work ahead or a tough conversation, you give your friends an extra boost of encouragement because you believe in them. To you, they are capable of anything they put their minds to. 7. You are prepared for anything. Someone has a runny nose. You have tissues. Someone spilled on their shirt. You have a stain remover pen. Someone rips a hole in their clothes. You have a sewing kit. Someone has a headache. You have Advil and a water bottle. Someone needs hand sanitizer. You have the good smelling kind, lotion to keep hands from drying out, and Chapstick because they usually ask for that next. You are like a boy scout and always come prepared. 8. You have to be right. All the time. Remember when your mom would say "Because I said so" well now you know why. It was because she was right or thought she was right and had to be right. 9. You end up deciding the plans for the evening. Because most planning goes like this "I don't know, what do you want to do?" "I don't care, you can pick." "Let's just do something fun." You end up just making a decision and everyone has to go with it whether they like it or not. 10. You embarrass your friends. Whether is it your dance moves, mom jokes or just being your awkward self, you embarrass your friends unintentionally. It is just part of being a mom. 11. You are protective of your friends. 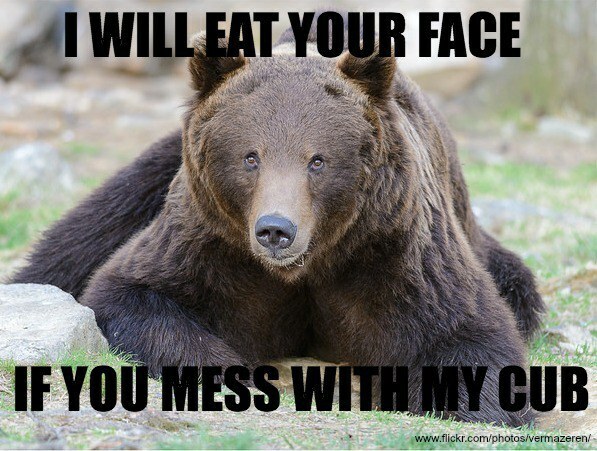 If someone decides they want to pick on your friends or break their hearts, you turn into mama bear. Nobody is going to survive the wrath of your protection. 12. You take action when something happens to one of your friends. If one of your friends gets sick, gets hurt or just has a bad day, you jump into mom mode. You do anything and everything to make sure they are O.K. You will put your needs aside to be there for your friends. 13. You care a lot about your friends. Your heart is filled with so much love for your friends. You cannot imagine a life without them. Their friendship is one of the things you cherish most in life and without them you don't know who you would boss around.